One of our jobs as parents is to help our children understand they are not the center of the universe, but instead live in a complex web of people who all have thoughts, feelings, and needs that might be different from the ones our child possesses at the time. How do we help our children grasp this idea? It takes a lot of time, a lot of “talks”, a lot of prayer, and a few memorable illustrations to help the knowledge move from the head to the heart. 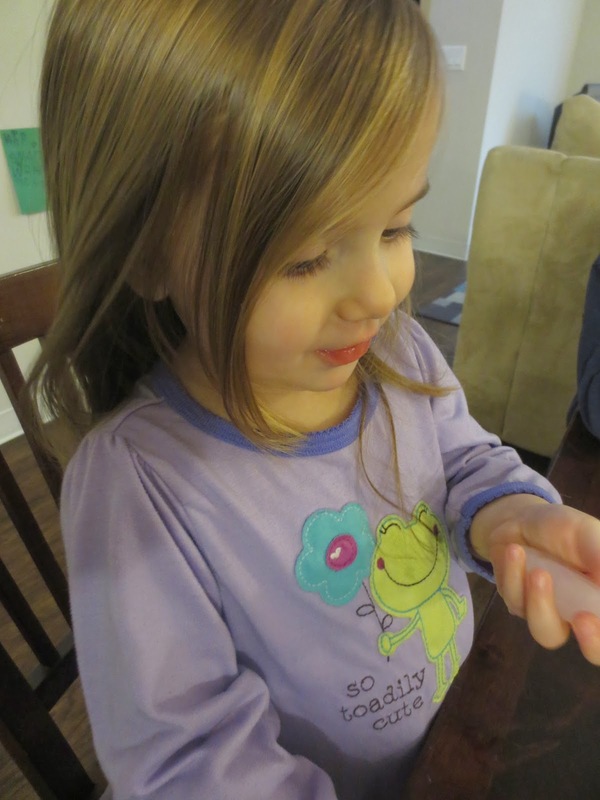 To do this activity, all you need is a few small sweet treats (we used marshmallows) and an ice cube. First, have your child eat one of the treats. Ask them how it tastes. They’ll probably say something like= sweet! sugary goodness! yum! Next, have them place an ice cube in their mouth until they can hardly stand the coldness. After taking out the ice cube, quickly put a small treat on their tongue. Because their tongue is so cold, they won’t be able to taste the sweetness! Ask them how it tastes now. This is where the conversation comes in :). At this point, you could talk about how sometimes we get so caught up in taking care of ourselves that we forget to notice the thoughts, feelings, and needs of those around us. Just as the ice cube numbed our tongue, so thinking about ourselves all the time can numb our hearts. When that happens, God has a harder time getting us to be His hands and feet because we’re not listening to Him! The activity suggests to make a list of 5 needs people you know have and work on meeting them as a family. We don’t know a ton of people up here yet, so instead, we decided to focus on paying attention to those in our immediate family (which has been a challenge for some of us lately!). We talked about asking the question: What are you thinking?, What are you feeling? and then How can I help you? While this wasn’t done perfectly all day, Asante in particular did a great job of going out of his way to seek ways to help others. We even got a double lesson on this today– we went out sledding for over an hour, and after we came inside the kids (who were “NOT cold” and did NOT need to go inside, ahem) realized how cold they actually WERE after thawing out for a bit. Jake and I got to reinforce that lesson that when we are cold (whether that be our bodies, our tongues, or our hearts), we lose feeling and can’t accurately gauge what is going on. Thanks to Justice Kids for another great lesson. What I love about their activities is that they are simple, but powerful. Give me an activity that has 10 steps and a list of supplies I need to gather to do it and I’m just not likely to make it happen, no matter how good it seems! But something like this I can do with what I have on hand, and it is still memorable to the kids. To read about a couple other activities we’ve done from Justice Kids, check out: Intro to Justice Kids and Developing a Heart of Compassion. And follow us on Pinterest for even more ideas about raising kids who care. Thanks so much for the idea. Thank you for this illustration. I’m going to use it tonight with my Church kids. I’m going to read the Good Samaritan story and then plan our teddys for cops (cops to give to kids) missions. That’s great! So happy it was helpful! When I first saw the picture on Pinterest, I had a different idea. You have a pile of marshmallows, which represents the child, and some ice cubes, which represent others. 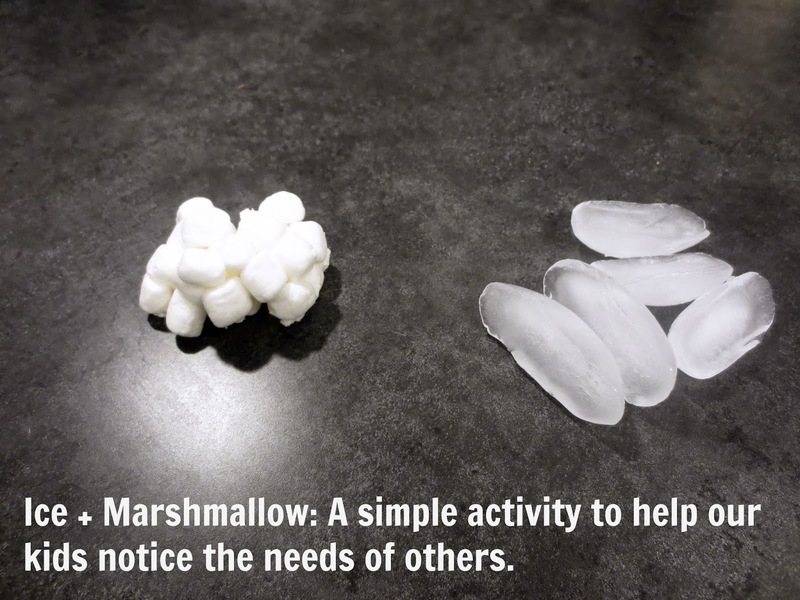 While your child is focusing on the marshmallows, the ice will begin to melt. Neglecting others can lead to them feeling down and less important.